It’s a little after 11:00 in the morning. The snow has stopped falling, but the sky still overcast and the temperature is hovering above 30 degrees. We look around and evaluate our position. More than four feet of new snow has fallen in the past few days and there are lots of promising drifts that might yield a comfortable snow cave. Trees protect us from the worst of the wind, and we have hiked far enough from the road that it’s unlikely that we would suffer an invasion by a stray snow mobile. This is as good a place as any. It’s time to get to work on our snow camp. 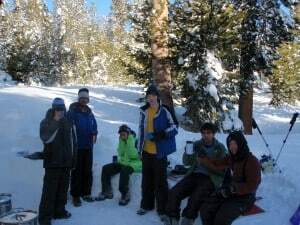 A huge blue tarp is pulled from an overstuffed backpack and spread out on the white snow between the trees. The boys start a pack line on the tarp, removing the Troop gear and food that they have been carrying. That will be placed onto a green tarp which has miraculously appeared a few feet away. The goal is to keep everything as dry as possible for as long as possible. Snow shoes are unclipped and pushed down into the snow, making sure that they are sticking up so as not to be buried by snow flurries during the afternoon. The Scout in charge walks around the perimeter of the site to survey the terrain. Promising spots for caves are selected, an outline of the kitchen is sketched in the snow, and a couple of the boys move off a few hundred feet to mark a latrine. Scouts locate their snow shovels, pull on rubber gloves, adjust their waterproof outer layers, and march off to claim cave sites. Avalanche probes will be used to judge the depth of the snow and (hopefully) locate any hidden obstacles, like big rocks or fallen trees, that can complicate the excavation and sometimes even force campers to start all over again somewhere else. I stay behind to fire up the stoves and start melting snow for drinking water. It takes a long time for water to boil at this altitude and the pots have to be constantly refilled with clean snow. My job is digging out the kitchen so the group can eat dinner together. Lunch will be eaten on the fly. Its quiet in the mountains during the winter. The only sounds in the camp are the wind and the camp stoves, which are barely audible through the woolen hats we have pulled down over our ears so they don’t become frost-bitten. After two hours of steady digging, I take a break and walk around to see how everyone is doing. It’s much more difficult to move without snow shoes to distribute body weight. Each step means that a foot can break through the thin layer of ice on top of the deep snow. The weight of your body then drives your entire leg hip-deep into the soft powder. Trying to pull your leg up can shift your body weight and cause the same thing on the other side, leaving you crotch deep and immobile. Sometimes the only escape is lying down and rolling away. Its aggravation, pain, frustration, and physical exertion all rolled into one frosty little experience. My “buddy” seems well on his way to digging out an excellent cave for us to share. He has already created an entrance and disappeared under the snow to enlarge our sleeping chamber. I note happily that most of the hard work will be done before I finish the kitchen and join him. Experience helps a lot, and he has been snow camping for years. The first Scout cave is barely OK. They have created a good sized entrance and made a start on the interior. But the boys are sitting in the snow taking a rest. I admonish them to keep working steadily if they want to be comfortable during the night. If Scouts sit in the snow too long, they will suffer conduction heat loss which can quickly turn into hypothermia. Constant movement is required to keep boys warm on a cold day like today. Close to the next cave, I notice a red drops in the snow. Like a CSI agent, I follow the drops to the next cave. The snow in front is covered in blood. There is a Scout sitting next to the cave entrance, holding a bloody sock against his face. Upon closer inspection, I discover he is dealing with a bloody nose, probably brought on by altitude and exertion. I help him up and we walk toward the kitchen area where we can get some gauze from the First Aid kit. Bloody noses are common occurrences with some Scouts, so there is no panic. It will probably stop in a few minutes. As we are walking past the area where my “buddy” is working on our cave, a soft whoosh explodes from the site. We look over and see that the cave has collapsed and he is completely buried in the snow. For a panicky second it seems that we are going to have to dig him out and I leap towards my shovel, but he is up almost immediately, kicking violently at the big blocks of snow that used to be the roof of the cave. He looks at me and shrugs. I sigh and we start walking again as if nothing happened. The bloody Scout gets to the blue tarp and sits down. The bleeding has almost stopped and he just needs to rest, but not too long. Everyone needs to working if they want to dig caves big enough to sleep inside. It’s almost 3:00 pm and there are only about two hours of daylight to finish the kitchen, help dig a new cave, and make sure all the Scout caves are ready for temporary inhabitation. The water on the stoves is just starting to boil. The temperature has dropped below 30 degrees.